Education is increasingly expected to support the flourishing of competitive industrial economies. It is held to account by means of assessment in an attempt to ensure that it delivers the goods. 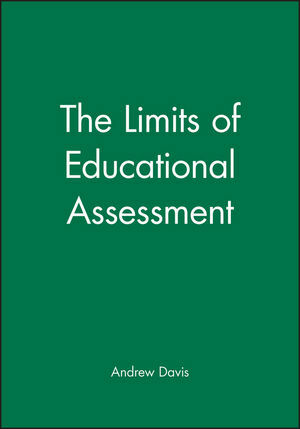 This book argues that assessment cannot in principle detect much of the real learning required in this scenario. Andrew J. Davis is Lecturer in Education at Durham University since January 1990. He taught philosophy of education at Homerton College, Cambridge from 1983 to 1989. He has taught most of the primary age range over many years, with a specialism in mathematics. He has an academic training in philosophy. Part I: The Need for a Philosophical Treatment of Assessment. The Social and political context. Summary of the argument to follow. Part II: Accountability and the Economy. Accountability, influencing teacher behaviour and pupil attainment. What does the industrial economy need? The mythology of literacy and numeracy. 'Rich' or 'proper' knowledge and understanding. Literacy, numeracy and proper knowledge. Part III: Understanding and Holism. Holism about propersitions and content. Richard Skemp's cognitive maps, and the relational/instrumental understanding distinction. Part IV: Belief and Language-based Assessment. Part V: Implications for Assessment. Making judgements about rich cognitive achievement on the basis of limited samples of behaviour. Part VI: Transfer, Abilities and Rules. Psychometrics, trait discourse and transfer. Classification: substances and their dispositional properties. Abilities, competencies, traits and skills. Mathematical performances and similarity judgements. Is arithmetic a special case?. Wittgenstein rule-following considerations and a possible sceptical argument. What follows from scepticism about fine-grained transfer of cognitive achievement?. Bennett and Desforges on matching. Matching (1) for the aquisition of new declarative knowledge. Matching (1) for the aquisition of new abilities or skills. Formative assessment, matching and assumptions of linearity. Implications for the organisation of learning. Part VIII: Reliability, Validity and Criterion-referencing. The common language: obtaining reliability at the expense of validity. Rich integrated competencies and the abilities of student teachers. Part IX: Is there a Future for Assessment and Accountability?. Possibilities for schooling not dominated by instrumental accountability. * Rooted in contemporary educational policy developments, the book draws on analytical philosophy to make fundamental criticisms of educational assessment.